Click through these six screens to learn how to play. Add the card from the top of the deck to the board. 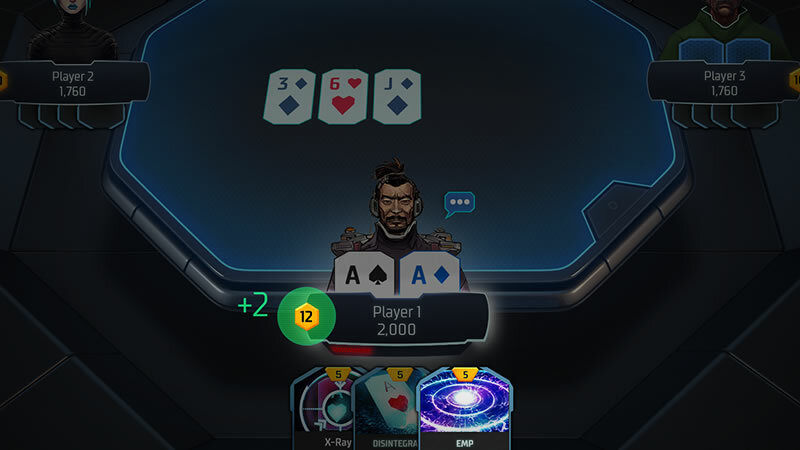 The card added is visible and usable for all players in the hand. Can be played at any point during the hand. 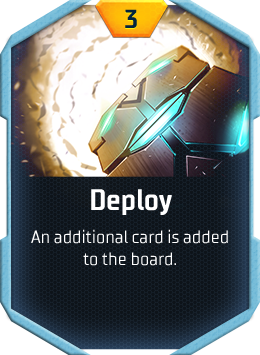 Due to design space, Deploy has a cap of 2. This power can be played a maximum of twice in a single hand, creating a board with seven cards total. The final hand is not affected. The best hand made by a combination of five cards, from hole cards and board cards, will determine the winner of the hand. Allows a player to expose one hole card from each opponent. If one of the player’s hole cards has already been revealed then the power will have no effect; an opponent’s complete hand can never be exposed against their will. Deals a third hole card to the player, who then picks one of his three hole cards to discard. Opponents will know if a card they saw previously in the player’s hand has been discarded. Shows the player the next two poker cards on top of the deck - they then choose whether to keep or discard them. Opponents know whether the player kept or discarded them, but not what they were. Lets the player know what the next two cards are (if they are kept), but doesn’t determine what happens to them. 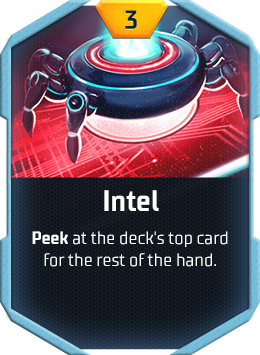 Unlike Intel, this power does not persist after the two cards are dealt. Allows the player to choose one or both hole cards to discard - they get new ones from the top of the deck. 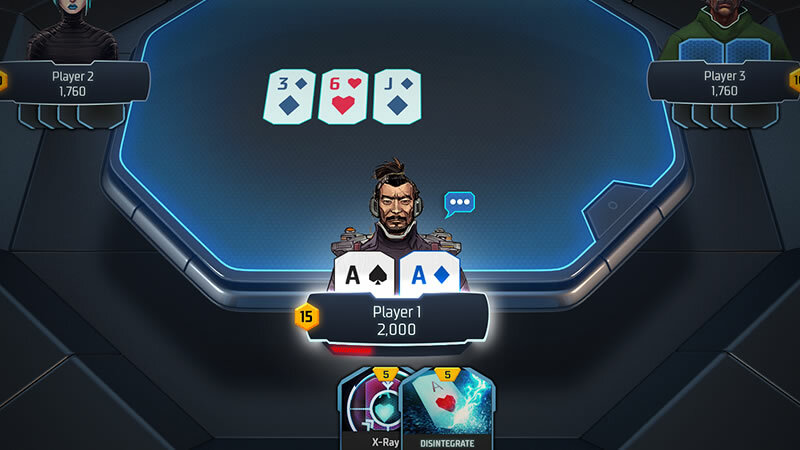 Note that depending on the powers played earlier in the hand, the player and/or opponents may already know which poker card(s) are on the top of the deck. Allows the player to see the next poker card off the deck for the remainder of the hand. This power persists through any number of powers. No matter where or when the card is dealt, the player sees the next poker card in off the deck. When that is dealt, they see the next card, and so on. All players see the next three poker cards off the deck. 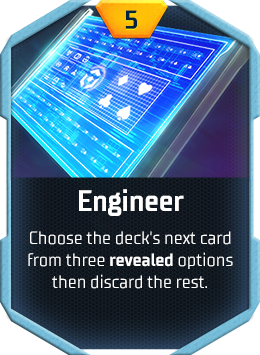 The person who played Engineer then picks a card to become the next card off the deck. The other two poker cards are discarded. The poker card remains visible to all players after it’s selected, until it’s dealt, changed or the hand is over. Only the next card is shown. Once it’s dealt, the effect is over. The poker card will not necessarily be dealt to the board (or at all). 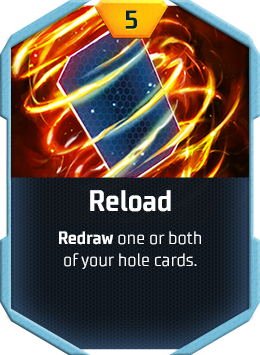 If another Engineer, Reload or Upgrade are played after Engineer, the card could wind up in a player’s hand or be discarded. Prevents any other powers from being played on the current street. Only works on the street it’s played. E.g. if played on the flop, other powers can be played on the turn or river. Has no effect on powers already played. E.g. 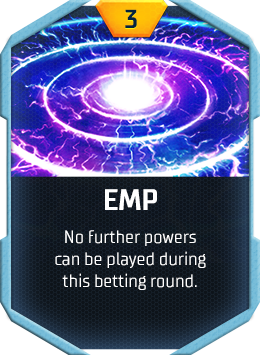 a card that was Disintegrated before EMP was played is still gone afterwards. Removes a board card dealt during the current street. Can be played only twice per hand. This can be at any point in the hand (two cards can be removed on the flop, for example) but players must still be able to make a five-card poker hand at showdown. If played on the flop, the player can choose which card is removed. If played on the turn or river, only the card dealt on that street can be removed. 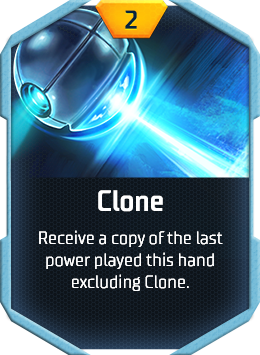 Gives the player a copy of the previous power played in the current hand (if no power has been played yet, Clone cannot be activated). If two or more powers have been played in the current hand, Clone will always copy the most recent one. Can be used to get multiple copies of a power (e.g. 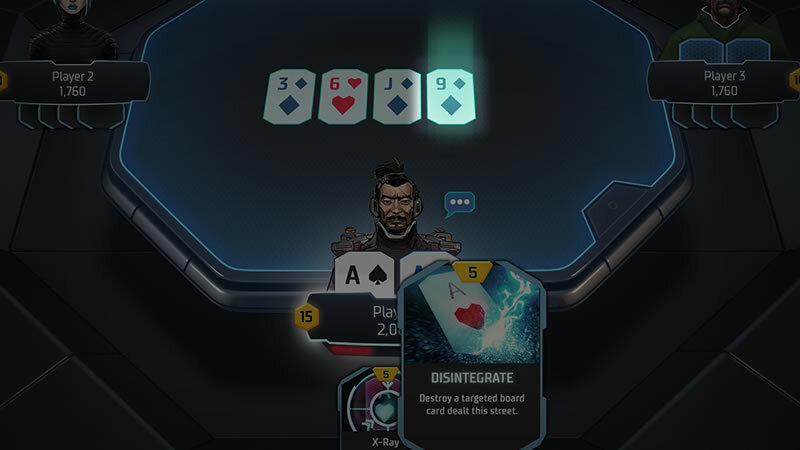 a player can hold two Disintegrates even though multiple copies would not be dealt normally). New powers created by Clone cost energy to play and act as that power in all other respects. Each Power Up tournament has a set number of unique powers assigned to it and the system awards each power a unique value. E.g. if there are nine unique powers, each power gets a unique number between 1 and 9. Each time a player requires a new power, the system generates a random number between 1 and the maximum number of unique powers that are assigned to the Power Up game variant. The player then receives the power with the corresponding number. 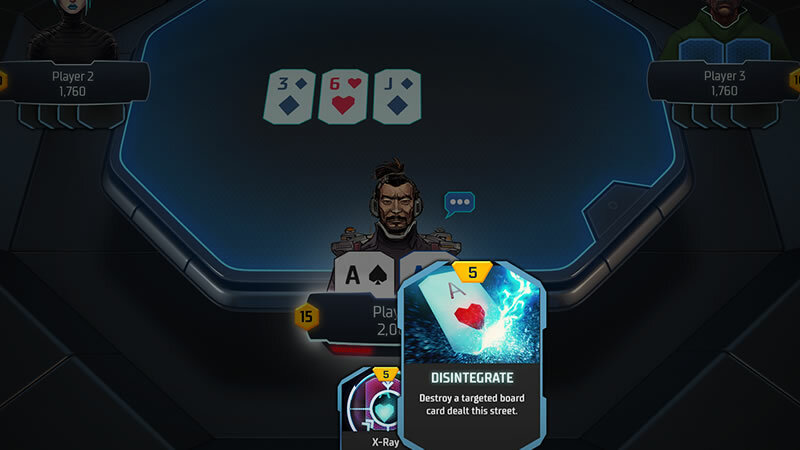 Powers are visibly ’dealt’ to players similarly to poker cards. All players start the tournament with the same number of powers. For balance reasons, the system does not allow the same power to be dealt more than once to the same player at the start of the tournament. Unlike poker cards, powers persist between hands until they are played. A player who doesn’t play any powers in a hand keeps them for the following hand. 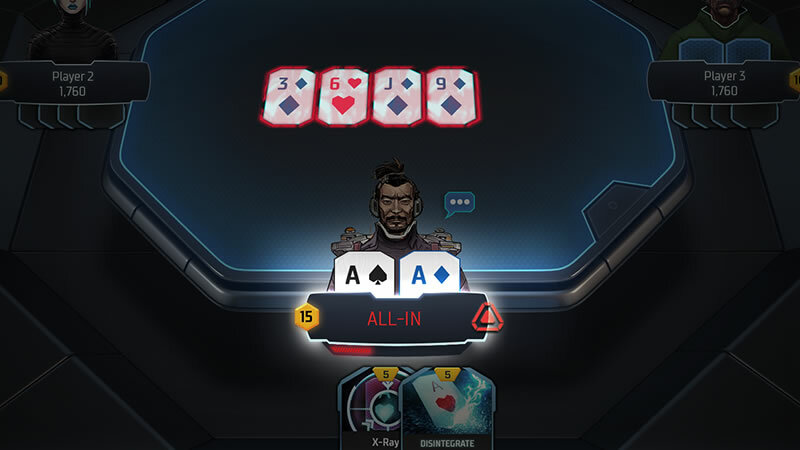 Players receive one new power every hand whenever they hold fewer than the maximum number of powers. It is possible for a player to begin a hand with fewer than the maximum number of powers (for example, if they’ve used them all in the previous hand). Players cannot be dealt a power that they already hold. Power Up is currently available in a Sit & Go tournament format with a limited number of players. In future, we will look to expand the offering to multi-table tournaments to allow more players to compete for larger prize pools. A set number of Energy units used to play powers. Players take their turns clockwise as in normal poker; they have a set time to act that is used for both poker actions and playing powers. A player’s turn ends when they select a poker action (check/fold/call/raise); they must play any powers they want to play before they act. If no powers are played during the hand, it plays out identically to regular no limit hold’em. Powers can alter various parts of the board, players’ hole cards and/or poker cards left in the deck, but the ultimate winner of the hand is still the player making the best five-card poker hand at showdown, or the last player with hole cards remaining if everyone else folds. In case of ties, the pot is split as in regular hold’em. After each hand, players who have fewer than the maximum number of powers receive one additional power and two additional Energy units (up to a preset cap). Each tournament continues until one player holds all the chips, as in regular hold’em. Power Up tournaments have a Winner Takes All payout format. When a player goes all-in, any cards that are already showing on the board may no longer be targeted by any powers. For example, if someone goes all-in on the flop, Disintegrate may not be played to destroy a card on the flop. 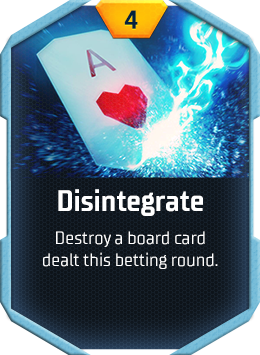 Subsequently dealt cards can still be targeted – if a turn card is dealt, Disintegrate could be used to destroy it. This is indicated by a special visual effect that ‘locks’ already dealt board cards and prevents them from being targeted by any powers. 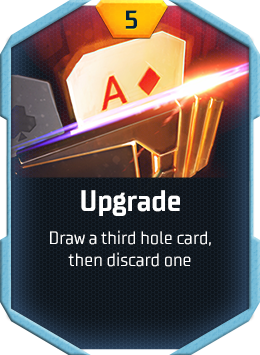 When a player goes all-in, their hole cards are also protected from the effect of powers that can change hole cards. Players may voluntarily take an action that reveals their hole card(s) to their opponent(s). 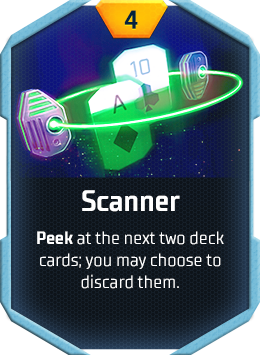 Example: Bob plays Scanner and keeps the next two cards in the deck. Alex then plays Reload and elects to redraw both hole cards. Because Alex voluntarily played his own power and used it on revealed cards, both of his hole cards are revealed to Bob. 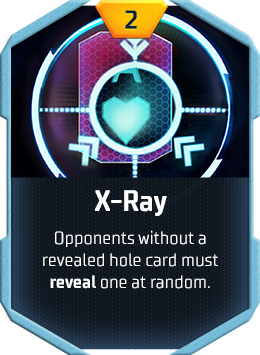 In all cases, players will always see an indicator that shows which of their hole cards are revealed to which opponent(s). Because the game's showdown requires a five-card poker hand, some powers have a cap on the number of times they can be played in a single hand. E.g. Disintegrate cannot be used if the sum of cards on the board and remaining cards to come is three.